Democrats Face The Two States Of Texas: Urban And Rural : It's All Politics The good news for Texas Democrats is that the state is becoming more urban. The bad news? It could be many years before urban Democratic voting margins are high enough for them to win statewide elections. Texas is beginning to trend urban (downtown Houston, left), which could be good news for Democrats, who tend not to do well in rural areas like Wise County near Boyd (right). All this week, NPR is taking a look at the demographic changes that could reshape the political landscape in Texas over the next decade — and what that could mean for the rest of the country. Texas is a large, diverse state with broad regional differences in population and demography. Its politics is subject to wild swings, too, depending on location. Take the 2012 presidential election, for example. 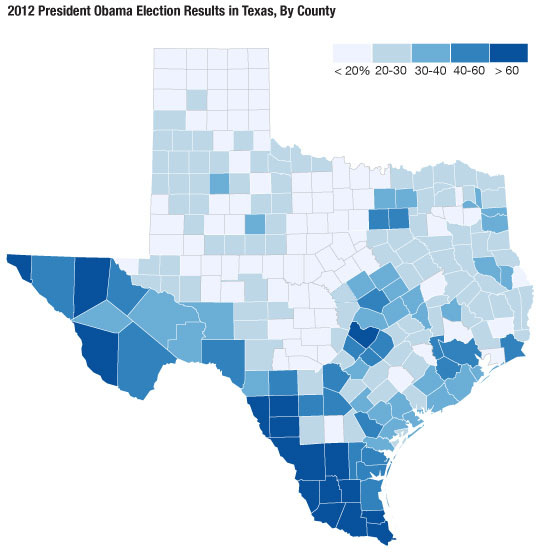 President Obama, who didn't contest the Lone Star State, got only 41 percent of the statewide vote last year. Compare that with the 57 percent of the vote received by former Massachusetts Gov. Mitt Romney, who also didn't devote any energy to Texas. Romney's impressive margin shrinks, however, in the large counties. In those places, Obama split the vote with Romney, with each candidate receiving about 48 percent. And the margin changes slightly more in Obama's favor inside the five largest counties, which he won with about 52 percent. Outside these urbanized areas, however, Democrats struggle. Romney won all the other counties with 70 percent of the vote on average. What could be heartening for Democrats, who haven't won a statewide race since the early days of the Clinton administration, is that the state is trending urban — and those places are starting to turn blue. The bad news is that they're still getting clobbered in rural and exurban areas, and it could take many years to increase urban margins to high enough levels for them to compete in statewide elections. Matt Stiles is data editor on NPR's News Applications team. Follow him on Twitter at @stiles.